Belmount Hall is situated about 10 minutes from Ambleside, 1 mile north of Hawkshead, within easy reach of Esthwaite Water and Near Sawrey. The house enjoys superb views of Esthwaite Water, with Gummers How in the far distance. It was built in 1774 by the Reverend Reginald Braithwaite, who was vicar of Hawkshead for 38 years. Between 1840 and 1899 the house was owned by the Reverend Doctor Whittaker, who made a number of alterations to accommodate his 9 children and, it seems, some fifteen servants. One of his great-great-grandsons, who lives in Seattle, USA, has provided a substantial amount of historical material about the house and the family. People around the world have fallen in love with the tales written by Beatrix Potter about mischievous animals… Many of which were based on her visits to the Lake District. 2016 marked 150 years since Beatrix Potter was born. In 1937 Beatrix, along with her husband William Heelis, agreed to buy Belmount Hall from Rebekah Owen, a good friend of theirs. They acquired the Belmount estate in 1938 and Beatrix Potter was given the task of sorting out the house and clearing the gardens. 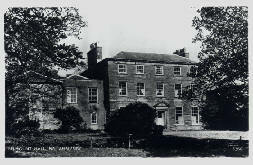 Her husband, William Heelis, gave Belmount Hall to the National Trust, after her death. Although there remains a lot of work to be done in the walled garden, we have tried to continue the gardening philosophy of Beatrix Potter.